Vusala Kerimova was born 30 years ago in one of the usual days of November in ordinary Baku family. As all her contemporaries she went to school and also to one of the schools of music, later she successfully graduated both of them. In summer of 2004 she was preparing for exams to the university. In that hot summer day nothing presaged the accident which showed us in future how Vusala is spiritually strong and how she loves life. Because of imprudence Vusala fell and got the backbone injury. Since then started her second life - second life because after such severe trauma it was the miracle that she stayed alive. The new life she began in wheelchair because as a result of injury she could not walk. Of course it was very hard morally and physically. But hero of our story was trying to lead an active life and prove to everyone that she did not give up. She returned to life and soon she achieved success in sport. 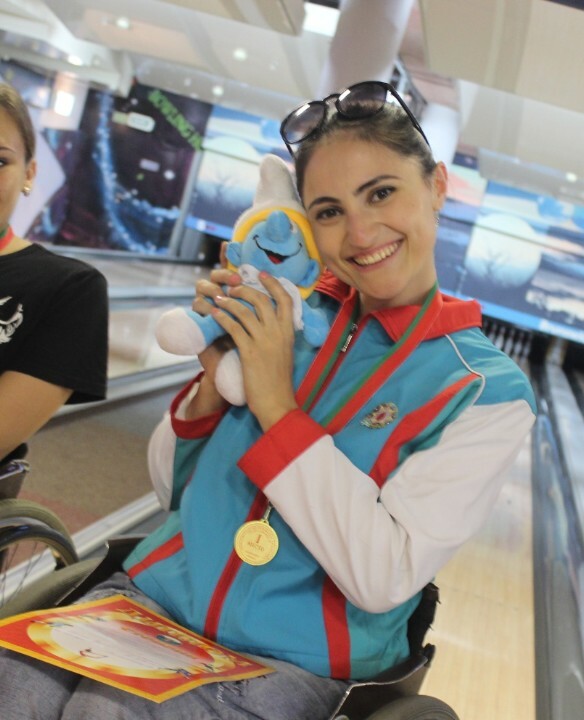 After some time Vusala began to do the paralympic kind of sport - paralympic fencing, and soon she became silver medalist of the Azerbaijan championship. It was only beginning of her perennial success in sport. In 2012 she got an offer to do dancing in wheelchair. She was pleasantly surprised because she has never seen before the people who dance in wheelchair. In same year were 3 trips to Minsk and first time she saw how dance the disabled people. The sport dancing in wheelchair – is the wonderful kind of sport, which also is rehabilitation for people with disabilities. The acquaintance with this kind of sport changed the life of Vusala. After return to homeland she began to dance as the first among girls having disability. After serious trainings Vusala with her partner became bronze medalist of Belarus Open championship in standard program of duo style (two people with disabilities). Then she started to dance in Kombi style dancing (person with disability and typical man) in Latin-American program. With her partner they became winner and medalist most of the international competitions. In 2012 on “Continents Cup” competition they took 3-rd place, after one year on the same competition in Moscow they won gold medal among beginners. By participation in different international tournaments that are being conducted in Russia, Poland, Italy and other countries Vusala and her partner many times took top places. According to Vusala, which practices sport dancing 5 years, this kind of sport changed whole her life, and allow to her no only to feel taste of sport victories, but also to love life more. "My personal experience shows that this kind of sport plays a very important role in integration of people with disabilities to the society, and I call up disabled people, which sit at home and lead passive type of life, to try their chance in wheelchair dancing. Then they will feel how their life changes to best" - Vusala is sure. Do you think that successes of Vusala finished by this? The hero of our history is the first woman-skydiver in Azerbaijan. Vusala was not afraid to do the thing that most of us would be afraid to do. Four years ago on special competitions organized in Moscow she jumped from height 4000 meters, and 3 years ago on the similar tournament in Minsk she jumped in tandem with skydiver from height 3200 meters. She iterated this record at this year and received certificate of 3rd rank Skydiver. 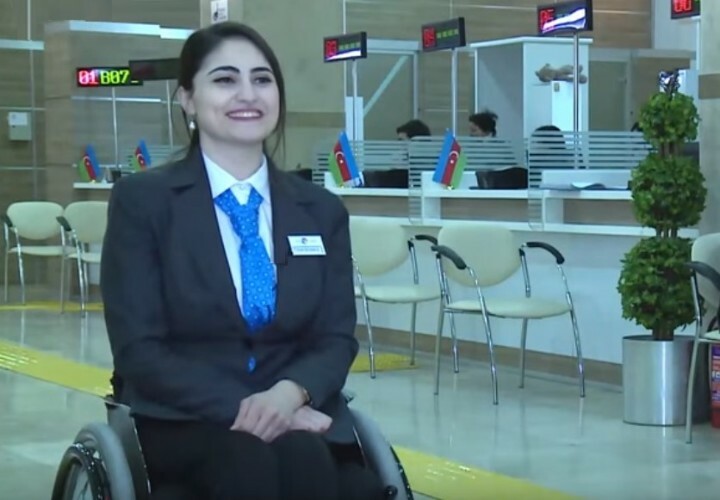 All these successes leaded to awarding Vusala Karimova with medal «Tərəqqi» («Progress») for contribution to development of paralympic movement before celebration of Day of Youth in February 2016 by decree of the president of Azerbaijan Republic Ilham Aliyev. Vusala works and helps to many her co-citizens. At present time the hero of our story works in one of the Centers of “ASAN Xidmət” (The State Agency of presenting services to citizens and social innovations under the President of Azerbaijan Republic) and helps many citizens by consultations, which appeal to Center for solution their social problems. Thereby she tries to be helpful for society. Despite all this Vusala is not content only with her sport victories and job. She implemented her dream – to study in university. At present time she is the 5-th year student of Jurisprudence Faculty of the Moscow State Humanitarian and Economic University. There are no doubts that in future by working in juridical area Vusala will achieve the great professional successes. Getting acquainted with not easy destiny of Vusala, seeing her victories, we understand why her friends and other people call her “The Champion of life”. And the main point, history of Vusala proves again that the fortitude-the main guarantee of success.